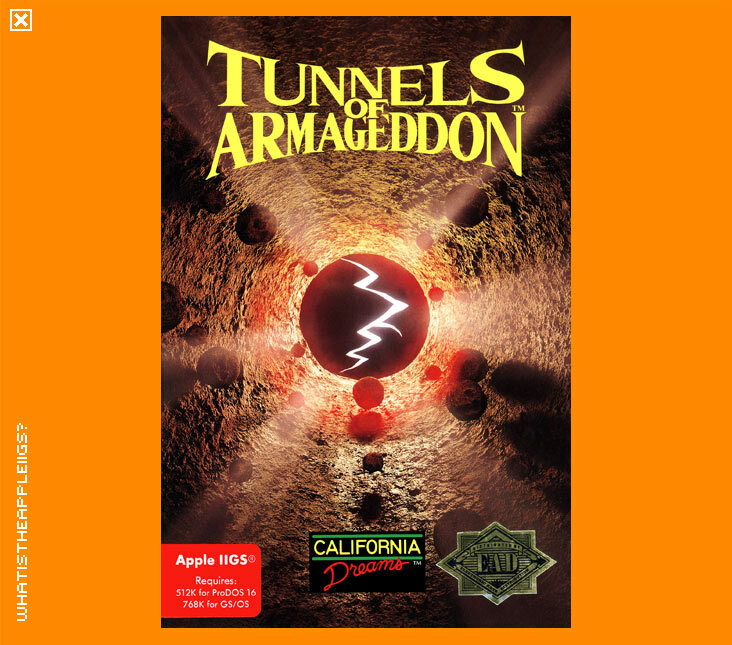 In Tunnels of Armageddon you are assigned the duty of saving the world. A tunnel maze created by an alien race discovered under Antarctica has been made as a test of human capability, to prove we are intelligent enough as a species. Failure results in extinction. Success and we acquire the knowledge of hyperspace travel. 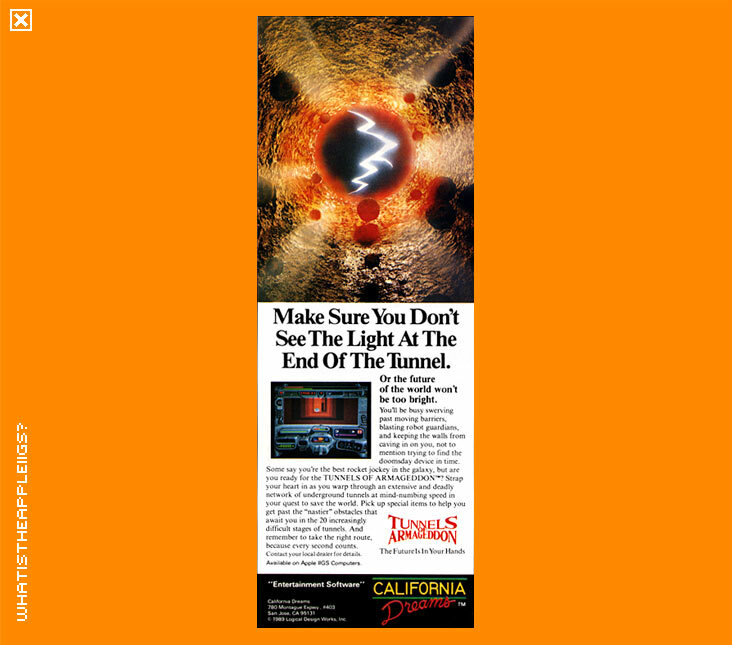 Time is the key factor - a detonation sequence is triggered as soon as you enter the tunnels, which is represented as a red bar at the top of your display. The green bar displays your progress through the tunnels and is shown below the red bar. Keep ahead of the red bar - if not, kiss the planet and yourself goodbye in a quick, bright flash. So grab your mouse, with which to move left, right, backwards to slow down and the button to shoot, and read on. Throughout the tunnels, you will zoom past blue or grey generators. By all means, zoom past them, but blow 'em up along the way! Doing so will slow down the detonation sequence. Obviously, to travel as fast as you can, you won't want to run into walls but to avoid some means slowing down anyway. There are also power-ups that will help you travel faster in the tunnels, such as smart bombs, two weapon enhancers, speed-ups, etc. Some power-ups will kick in and take effect immediately, such as the weapon power-ups. Others can be used at the pilot's discretion such as the smart bombs, which will effectively destroy everything on screen by pressing "E". The speed-up will take effect immediately, but you can save it by pressing the space bar and pressing it again to reactivate. The speed up also auto navigates through the tunnels - so it's a very good idea to save it when you need it most! There is also a standalone auto-navigator, which starts when acquired, or you can press "R" to stop and start it. There is also a destructive force shield that when acquired will enable you to run into anything you choose without hindrance. Press 'W' to control when acquired. Other action keys include 'D' and 'I' - decrease speed by one notch or increase speed up a notch. 'S' will save your game, but this option is only available when you reach every fourth level when the "SEND" signal is shown; saved games are resumed from the main menu. Press 'P' to pause your game. Pressing escape will only cause heartache because it takes you back to the main menu. Some tips: there are three different types of tunnel: grey, green and red. Grey tunnels are the easiest but LONGEST tunnel to traverse. Red is the hardest, but if you know what you're doing, you're going to make it out of a red tunnel faster than a grey one. Green tunnels are an intermiediate step between the two. Tunnels of Armageddon is a true masterpiece in every respect. Even now, as a game released in 1990, it looks fantastic. It features some of the cleverest use of colour cycling and of colour palettes to create an effect that will truly have your body thrusting about as you turn corners down the tunnels. There's a sufficient story line, clever programming and design, fantastic graphics (I think the cockpit of your vessel, the HERMES, looks far, far better than the similar looking cockpit found in Interplay's Descent) and engrossing game play. All this at what a stock IIGS could run at: 2.8Mhz. 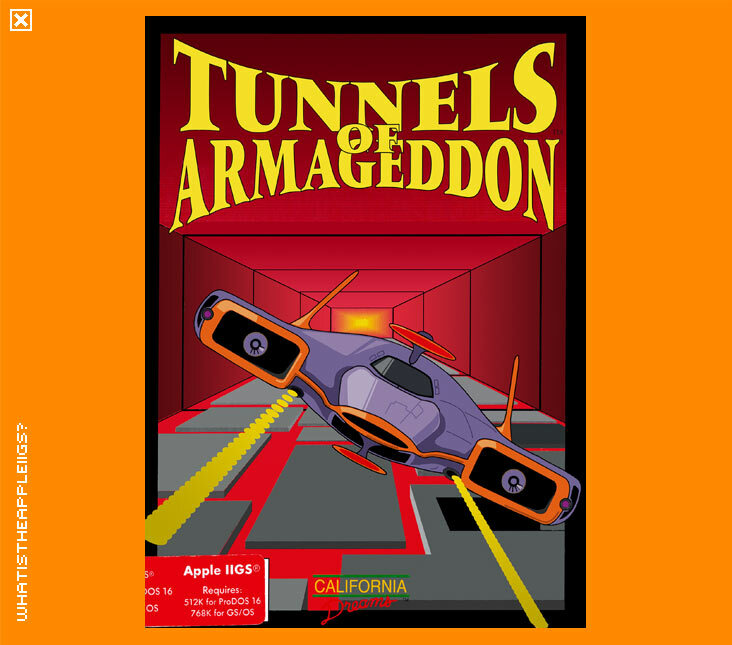 Tunnels was representative of the truly arcade quality of gaming found in the IIGS games released around 1990. It would have been great just to see ONE more year of mainstream IIGS game releases that would have carried on into 1991. Alas.